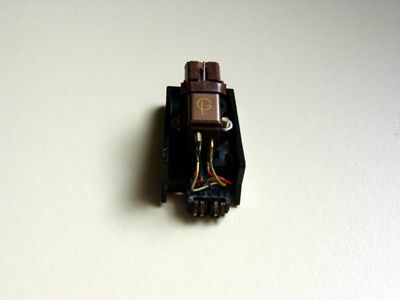 Phono Cartridge Mounted on Headshell. Note: In this tutorial I’ll use my Dual 1215 Turntable (circa 1970) as an example, which is typical of many turntables, although your turntable may differ. Be sure to consult the owner’s manual for your specific model. Refer to our stereo glossary to help with the terminology. Note: To prevent damage to the stylus, keep the stylus cover in place during this step. Right Channel Ground: GreenAttach the cartridge holder to the tonearm and secure it. Balance the tonearm for the weight of the cartridge so it floats. Unlock the tonearm from its resting post and rotate the counterbalance forward or backward on the rear of the tonearm until the tonearm floats. Make sure the tracking force indicator on the tonearm is set to ‘0’ and remove the stylus cover while performing this adjustment. Shure SFG-2 Tracking Force Gauge. Every cartridge model has a specific tracking force specification, usually ranging from 1-3 grams. Using the tracking force indicator on the tonearm or a stylus force gauge (best option), set the tracking force per the cartridge specifications. Anti-skating controls are found on some turntables. Simply explained, an anti-skating control compensates for the 'skating' force that pulls the tonearm towards the center of the record as it’s spinning and puts unequal pressure on the sides of the record groove. Anti-skating control is adjusted automatically as part of the tracking force adjustment on the Dual 1215 turntable used in this example. Consult the owner’s manual for your model as some have a separate anti-skating controls. Connect the left and right channel (usually white and red connectors, respectively) output from the turntable (usually under the turntable) to the phono input on the back of the receiver or amplifier. If there is no phono input, a phono pre-amp may be required. Do not connect to any input other than phono. A single ground wire must be connected between the turntable and the ground post (or a chassis screw) on the back of the receiver or amplifier. Help! My Roku Remote Isn't Working!